As well as our comprehensive range of new desks, we also stock a large range of Period Desks, all fully restored to a high standard in our own workshops. 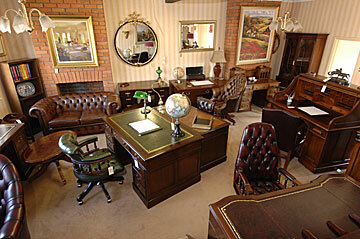 These range from Desks made in the 1950’s through to Antique Desks made in the Edwardian and Victorian Period. Please view our current stock listed below. A very unusual Edwardian '1901-1910', 'S' shaped Roll top desk made in Satin birch. Lovely interior made up of pigeon holes, letter racks & drawers. The desk is paneled all the way around & has pull out brush slides, for extra writing platforms. There are 8 drawers the bottom right hand drawer being a double drawer. Each drawer has beautifully carved shaped hand made handles a real feature to this desk. An Edwardian ( 1901 - 1910 ) Oak Glazed Bookcase. Two glazed doors, adjustable shelves inside. Shaped Pelmet top section. The base section has two drawers with the original art deco style handles. Cupboard doors with a further storage inside. A Charming, Edwardian ( 1910 ) Child's Writing Desk. Made in English Elmwood. Four single drawers with the original Brass handles. A pull out platform slide, a foot rest between the pedestal and side panel. Fully restored and fitted with a new Wine leather top. An Edwardian ( 1901 - 1910 ) Dickens Style Desk. Made using solid Ash, which is similar in appearance to Oak. The desk section has nine drawers with the original brass ring handles. A further two drawers are located on the desk top with a brass gallery running along the back edge. Polished to a light golden shade with an Olive Green leather inlays. A 1920's Country Style Writing Table. Manufactured in Pitch Pine, Oak and Beech. Three drawers with the original Brass Cup Handles. Gun Barrel style turned legs. Natural waxed finish. A Victorian Mahogany Slope top Writing Desk. Each pedestal has four drawers with the original turned knobs. The desk top has a lift up leather inlaid writing slope with two small drawers each side. Inside the slope are two further small drawers and letter dividers. Restored and re polished with new Olive Green leather inlays. A small solid Mahogany Polished top Desk, circa 1950 s. Could also be used as a Dressing Table. Seven drawers with figured Mahogany drawer fronts, decorative handles. The useful top drawer is full width. Shaped O Gee style feet. Re french polished. A large Teak 1960's Retro Desk ( unusually deep at 122 cm ) Inset plinth bases with a breakfront middle drawer, useful pull out side platform slides. The right pedestal has a double filing drawer with bars to suspend files. Brass Swan Neck style handles. New keys cut for the top three locks . Re polished and waxed, the top is lined with a one piece Wine Hide Leather top, decorated with Gilt Rose patterned tooling. A Pretty Queen Ann Style Walnut Desk. Five drawers with Burr Walnut drawer fronts and Brass pierced back handles. Queen Ann style legs. Polished and fitted with a new Olive Green leather top. A large Mahogany 1920's Paneled desk on shaped bracket feet. Nine single locking drawers with there original swan drop brass handles. Fully restored and re french polished. New Green leather top with rose pattern gilding. This desk is made in three sections. The Desk has solid fielded oak panels all the way around, a back paneled modesty panel and a pair of pull out wooden platform slides. Eight drawers including a double depth filing drawer. The middle drawer locks with a new key cut. Original wooden handles, plinth pedestal bases, Fully restored & re polished. We have fitted a new tan leather to the top with Rose gilt decoration. A 1930’s Original Oak Filing Cabinet. The locking tambour shutter concealing nine pull out filing trays with brass info tag holders. Cleaned and french polished. Medium oak shade. A 1920’s Walnut Panelled Desk. Useful extra depth of 35” . The left pedestal has four drawers, the right pedestal has three including a double depth drawer. a shaped middle section giving more leg room to work at the desk. Original Craved handles. There are two pull out platform slides located under the desk top. Panelled sides and back. Re polished to the original mid brown walnut shade and fitted with a new black hide leather. A very large and fascinating Mahogany Desk made in the 1960’s by the Abbass Office Furniture Company. Having been made with large overhangs to enable papers and charts to be spread over the working surface and also allow clients or staff to sit around the desk for meetings. There is a locking centre drawer with four single drawers in the left pedestal and a filing drawer and two further single drawers in the right pedestal. The original flat bar, curved Brass and Baker light handles have been polished and re fitted after the desk was re french polished to it’s original mahogany shade. Also located under the desk top are two pull out slides, one with a leather inlay and the other with compartments for pencils and stationary bits and pieces. The rear of the desk has a removable modesty panel. The desk top and one of the pull out slides have been re leathered with new Black leather with a thin gilding line for decoration. 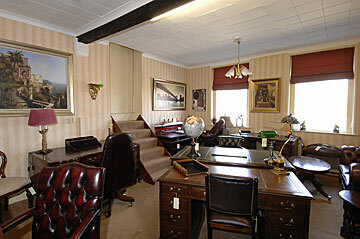 The desk is photographed with one of our Single style desk chairs to show scale. The desk was used by a member of staff working for the steel company ARMCO LTD ( American Rolling Mills Company ) in Letchworth Garden City, Hertfordshire for many years until they retired and took the desk home with them. A 1920’s solid oak, four drawer filing cabinet. Each of the four drawers has its original wooden handle and brass name tag plate. We have added filing bars supports to take modern-day files which can be removed if not wanted. Panelled sides and a polish top surface. Lovely original colour. This superb quality Mahogany Victorian Cylindrical Writing Desk dates from around 1870. There is a raised wooden gallery on the top section, the lockable cylindrical front lifts to reveal a pull out writing surface with three leather panels that have been re lined in tan skiver leather and thin gilt line decoration. The centre panel can be raised for writing with storage beneath. Six small working satinwood drawers and five faux drawers. The lower section has six lockable drawers with the original turned wooden knobs. The desk has been lovingly restored retaining the mellow mahogany shade. A small, petite Mahogany Edwardian ( 1901 - 1910 ) ladies writing desk. Nine locking drawers with the original period brass plate handles. Plinth pedestal bases with round turned wooden feet to raise the working height. Restored and polished with a new olive green leather insert. A fine quality 1930’s Mahogany Writing Bureaux. Three locking drawers with attractive brass handles, inlaid with figured mahogany grain. A Locking bureau flap and shaped cabriole legs. The bureau interiors writing flap has been inlaid with a new tan skiver leather and has letter racks and three inlaid drawers. A popular larger size Mahogany 1920's Panelled desk on plinth based pedestals. Nine single locking drawers with the original swan neck drop brass handles. The desk top has canted corners and bevelled front pedestal edges. We have re polished the desk keeping the original lighter mahogany shade and fitted a new olive green leather top with snake pattern gilding. A lovely example of a 1920’s English made Oak Roll Top Desk. Original supplied by M.W. EDGLEY. Office Furniture 154 Fleet Street, London, as seen on the original brass key escution plate. Eight drawers including a double depth drawer in the right pedestal with the original wooden handles. Panelled sides and back panels. A pair of pull out platform slides are located under the writing surface. The impressive interior has number of small drawers with brass name plate slots and various letter racks. We have sympathetically restored the desk retaining the original patina and colour. A 1950’s Mahogany Retro Desk. Seven drawers with shaped wooden strip handles. Locks on the right drawers. Re polished to a lighter mahogany shade and fitted with a new Olive Green leather top. A 1920’s Oak Panelled Desk. Four drawers in each pedestal with the original shaped handles.. A pair of pull out platform slides are located under the desk top. No centre drawer but a shaped middle section giving good legroom to sit and work at the desk. Restored and re polished keeping the original medium oak shade and fitted with a new Tan leather top with rose pattern gilding. Nine locking drawers each fitted with brass ring handles. Plinth Pedestals giving a good working height and kneehole space. Polished to a rich darker mahogany shade with a new red leather top fitted, snake gilding pattern. A late Victorian Mahogany Pedestal Desk. ( circa 1890 ) Nine locking drawers with wooden turned knobs. Castors are concealed under the pedestal plinths which help to move the desk once assembled. Restored and re polished, fitted with a new Bottle Green leather top with rose gilt tooling. Kneehole Width 20” Height 23"
A large Oak Roll Top Desk made by A Cutler & Son, Buffalo, New York USA, who started producing Roll Top Desks in the late 1820’s. This impressive example we think was produced around 1880. Each pedestal has four drawers with the original wooden handles. No centre drawer giving more legroom to work at the desk. The interior has various letter racks, drawers and pencil trays. The s shaped tabour shutter works smoothly and is lockable. Restored and polished to the original mid oak colour.